How many calories and sugar amounts are in your Christmas hot drinks? If you’re a Christmas Cup fan like I am (I swear I’m addicted to sugar and cream more than ever!) you may want it breaking down. Caffè Nero’s Belgian Truffle Hot Chocolate contains the most sugar (56.9g) – approximately 14 teaspoons of sugar. Unsurprisingly, out of the top 10 calorific and sugary festive hot drinks, seven are hot chocolate. 55% of the drinks contain more than your recommended daily intake of sugar. The festive season is fuelled by a huge excitement around Christmas Markets, mulled wine, a socialising season, and naughty hot drinks. Those laden with whipped cream, sprinkles and syrups. I’ve had about 4 since they launched on the 1st November. 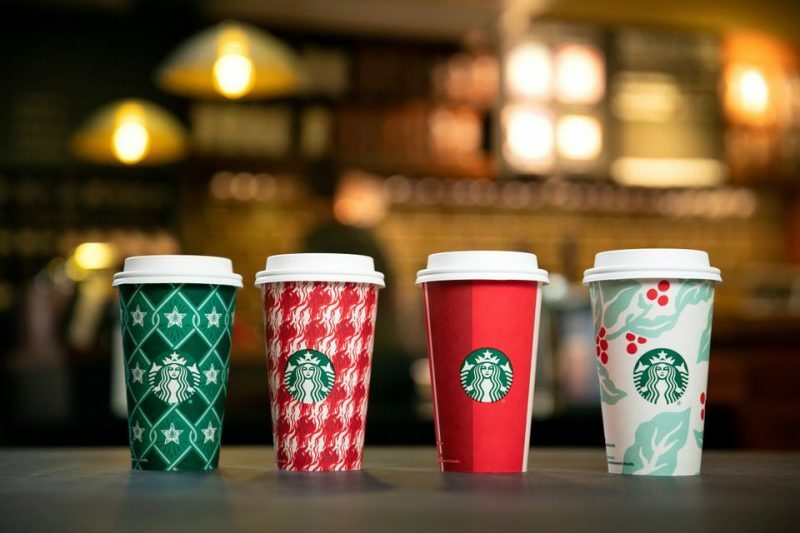 While the season allows you to indulge, OnBuy.com decided to take a closer look at the nutritional value of your favourite hot drinks released by five major coffee chains in the UK: Starbucks, Costa, Caffè Nero, Pret a Manger and Greggs. 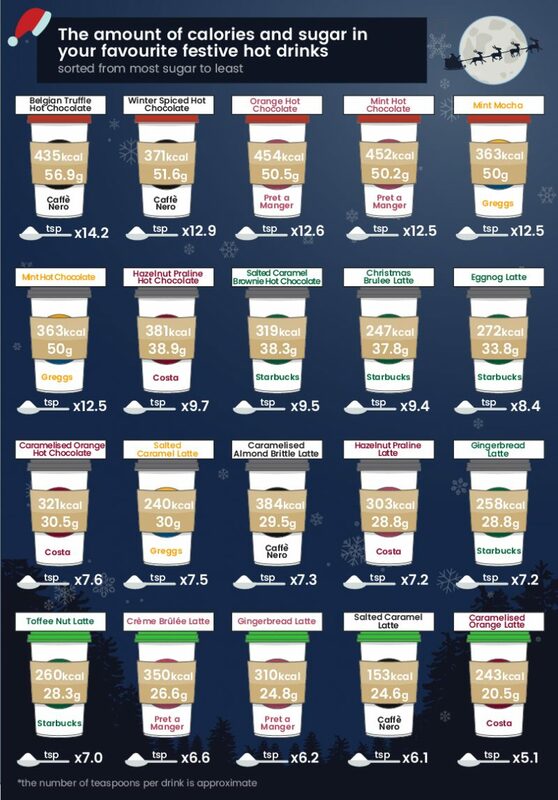 By comparing each festive hot treat, OnBuy analysed the number of calories and grams of sugar in each festive hot drink in order to see who slips in the most sugar and contain the most calories before additional sugar is added by the customer. The festive drink containing the most grams of sugar is the Belgian Truffle Hot Chocolate released by Caffè Nero, with a regular cup containing a whopping 56.9g of sugar; a whopping 14 teaspoons of sugar. This is followed by another Caffè Nero special; the Winter Spiced Hot Chocolate which contains 51.6g of sugar. Followed closely by Pret’s Mint Hot Chocolate (50.2g) – just under 13 teaspoons of sugar. Starbucks’s Toffee Nut Latte is the fifth ‘jolliest’ festive hot drink, containing 28.3g of sugar – a 28.6g difference from the sugar heavy Belgian Truffle Hot Chocolate offered by Caffè Nero. Pret a Manger’s Crème Brûlée Latte takes fourth place with 26.6g of sugar, followed by their Gingerbread Latte (24.8g). And finally, the retailers frothing up the festive hot drinks with the least sugar are Caffè Nero’s Salted Caramel Latte with 24.6g of sugar – equivalent to around 6 teaspoons of sugar. 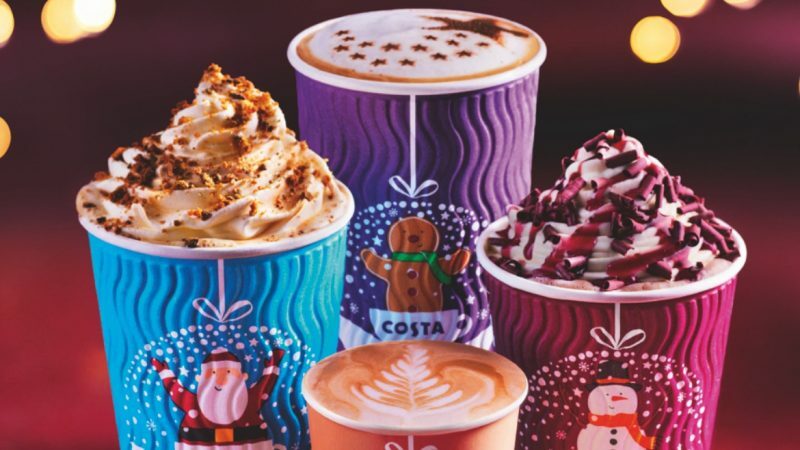 And the award for the Christmas hot drink with as little sugar as possible during an overly indulgent period goes to Costa, with their Caramelised Orange Latte – just over 5 teaspoons of sugar (20.5g). It seems that opting for a Salted Caramel Latte is the best way to keep the pounds off, as Greggs offer one with 240 calories, whilst Caffè Nero takes the crown for the hot drink with the lowest number of calories (153). The research was gathered by selecting the regular cup size offered by the retailers (12oz). It must be noted that while ‘regular’ was chosen, the measurement is approx., and Starbucks measure their hot drinks in fl oz. And on another note…. what drink is your guilty favourite this year? I enjoy a Toffee Nut Latte a little too much!